Grilled Bratwurst cut into slices and served with a Horseradish Mustard Sauce makes a fantastic summer appetizer. With a jar full of toothpicks, it becomes an easy party food for a summer get together. The sauce gets a whole lot of kick from the horseradish and is made from only 4 ingredients. It also makes an excellent condiment if you want to serve your bratwurst on buns instead of as an appetizer. And with the Johnsonville® Sizzling Sausage Grill, you can enjoy the flavor of outdoor grilling without leaving the comfort of your kitchen. This electric indor grill is super easy to use and only takes up a little counter space. In the south, we get tons of evening thunderstorms with heavy downpours during the summer so this indoor grill comes in really handy. 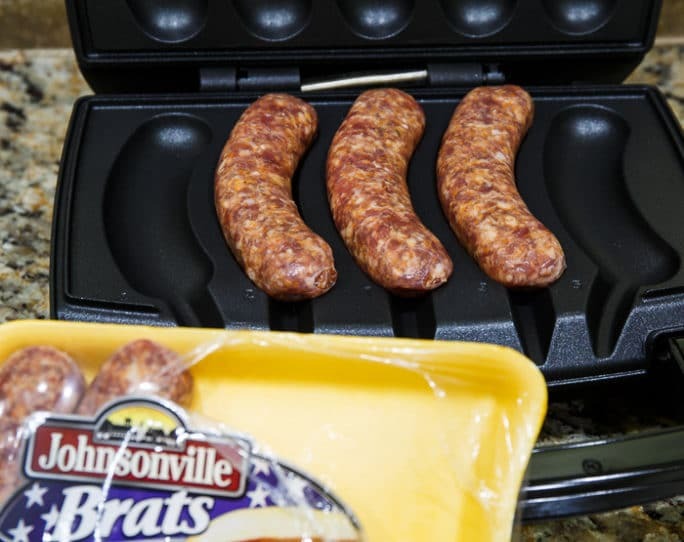 It holds up to 5 Brats, the number that come in a package of Johnsonville® Brats and the enclosed design evenly cooks them. The Brats cook quickly in 10-15 minutes. 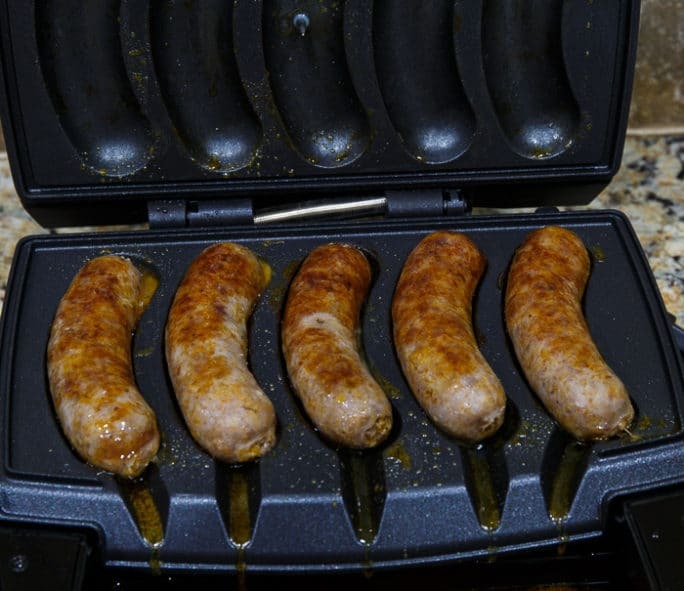 A temperature probe automatically shuts off the grill when the brats are cooked all the way through. 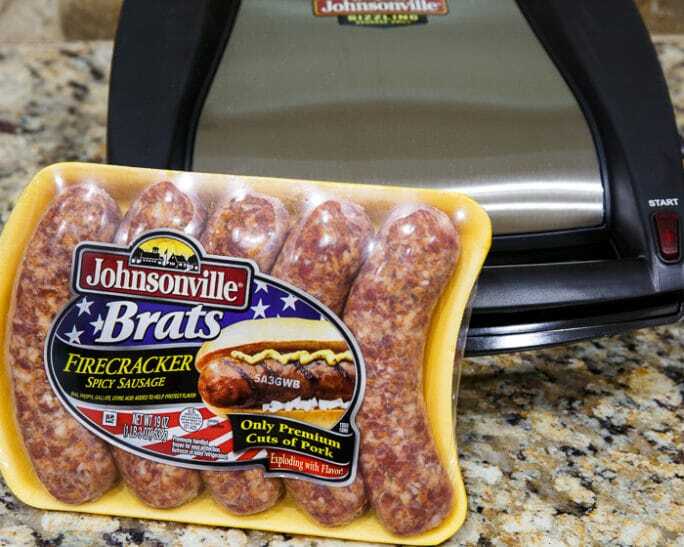 I love using Johnsonville® Firecracker Brats. They have just the right amount of heat and a totally amazing flavor. And the grill plates go in the dishwasher for easy cleanup. In addition to bratwurst, you can also cook Italian sausages to add to spaghetti sauce on the Johnsonville® Sizzling Sausage Grill. 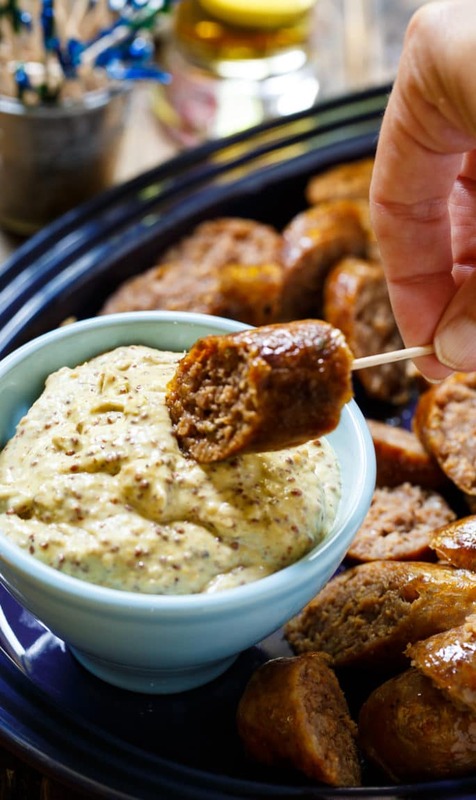 Add your perfectly grilled and juicy Brats to a bun with sauerkraut or slice them into bite-sized pieces and make an easy Horseradish-Mustard Sauce to dip them in. Summer entertaining doesn’t get any easier. 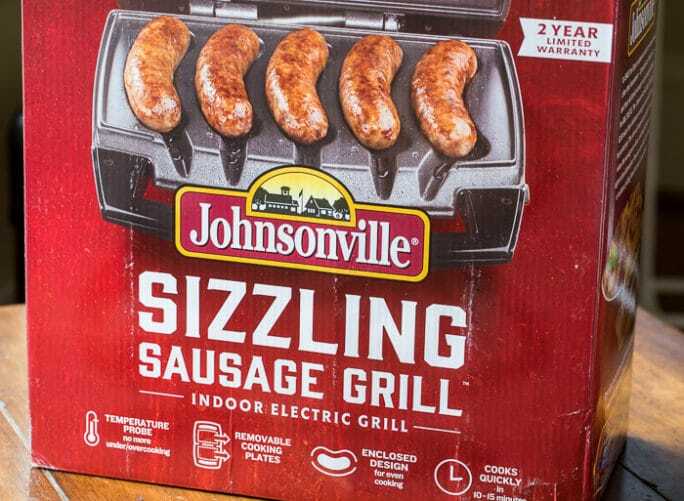 Find out how you can get your own Sizzling Sausage Grill so that you can grill perfect sausages every time and follow Johnsonville on Facebook, Instagram, Twitter, and Pinterest for more summer grilling inspiration. 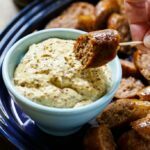 Grilled Bratwurst cut into slices and served with a horseradish mustard sauce- makes a wonderful and easy summer appetizer. Grill brats according to indoor grill instructions. Let cool and slice into bite-sized pieces. In a small bowl, stir together both mustards, mayonnaise, and horseradish. This entry was posted in Appetizers and tagged bratwurst, Pork, Sausage. Bookmark the permalink. Our New Year’s Eve meal is “bapas”. Bavarian Tapas. We are excited to try this dip for our sausages. We are also doing bretzels with cheese, and a German tomato and cucumber salat. Happy New Year or Frohes neues Jahr! Appetizer??? Guuuurl, I could call this dinner!! All I need is a platter of these amazing bratwurst and a vat of that spectacular horseradish mustard sauce!! Seriously, this looks amazingly delicious! Pinned! Cheers! Oh I’ve never seen a grill like that before! So neat, Christin! My husband and I make brats all the time, so we’ll have to try this sauce! 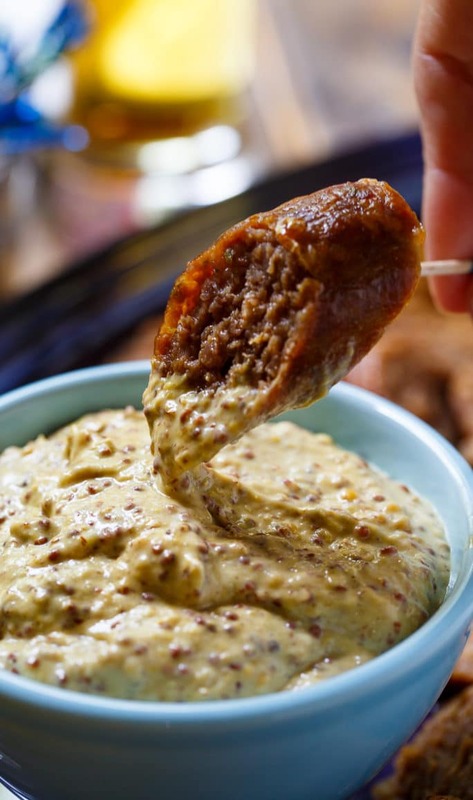 That horseradish mustard sauce looks spicy and delish! These would definitely make perfect party food! Loving the sound of that sauce! Hope you had a great holiday! !